This update is long overdue, and I apologize for those who have had to wait, but I wanted to do it justice. I was diagnosed with Irlen Syndrome, or Scotopic Sensitivity Syndrome, almost two years ago, and got my Irlen tinted lenses about a year and a half ago. Since then my life has been radically different. If you have no idea what I am talking about, read the two posts linked above (in order) before continuing. I just reread the first post I wrote after being diagnosed with Irlen Syndrome, and got really depressed for ten minutes. Did I really live like that? Sadly, the answer is yes. But at the moment, it feels like a lifetime ago. I live in a completely different world now. My mom once had a surgery that saved her life. She was in such extreme pain beforehand, that when they removed the problem, and asked her even hours later how much pain she was experiencing, on a scale of 1 to 10, she told them it was a zero. Hours after a long and invasive surgery, she felt no pain. It was that sudden and extreme of a change. My situation was different in that I did not realize beforehand that I had a problem. Or that my life could be better. I did not realize that I had a medical condition, that something so “small” as a miss-wiring in the brain, could be such a big deal. After all, my brain seemed to work fine. I did not have schizophrenia, was not blind, or anything else that I or others could relate to as obviously, medically wrong. However, an hour after my glasses arrived in the mail, direct from the laboratory in California, I sat down with a brand-new book and read 200 pages in three hours. That is five times faster than I have ever read anything in my life, and I remembered it, understood it, and was not at all tired. The difference was just as stark as my mom’s surgery, even though outwardly I didn’t have the normal evidence of change–scars, bandages, hospital visits, medical bills, doctors reports, etc.–that many people expect to see. All I had, to prove that anything was different, was my word on it. And the glasses. I already wore glasses, but now they are blue. I have found, surprisingly, that many people write them off as “designer” sunglasses, and don’t pay them any attention. The problem with not having harrowing tales of illness or lab tests, doctors arguing over diagnoses, procedures to hope and pray for, crutches or wheelchairs or therapy or other proof that you are sick, is that people forget. One day a friend sees you with clear glasses, and the next with blue glasses. You laugh and chat and talk about how different things are and how much it helps, and then it is over. The next day they are on to a different topic and they never bring it up again. People forget so quickly. Please don’t misunderstand me, I’m not fishing for pity. Pity is the last thing I want. And I don’t need to go on about it constantly, either. The problem is the disconnect. My life is not just better now, it is radically different in nature. And people forget. They forget that I’m not the same person, that my brain does not operate in the same way, that I don’t have the same abilities and limitations as before, or the same way of looking at the world. Once in a a while someone will throw out a casual comment, “So how are the migraines going? It feels like you haven’t had one in a while. Are the glasses helping with that?” Yes, they are, but that is honestly only the smallest, though most visible, evidence of change. (If you suffer from migraines, you know what a radical statement that is to make.) For the most part any evidence of illness and recovery have been invisible. Again, I’m not looking for sympathy, just acknowledgment. Some acknowledgment from other people that something was very, very wrong, and that it is better now. Some acknowledgment that my life is completely different now. I can’t be too harsh with others though, because I forget too. Though I wish to clarify that what I so frequently forget is not an acknowledgement that there has been a change, but the degree of that change. I frequently forget how radical it is and that I am not bound by the same limitations as I used to be. Several times a day I will begin a task that used to be difficult for me (though I would trudge through it anyway) and still get a cringe in my stomach as I begin, forgetting that it won’t be so laborious, and then as I continue and notice how easy it is, the clenching relaxes and I hit my stride and continue on and finish more quickly, more easily, and without pain. For example, I took German in high school and continued to learn on my own through college and later, but reading and writing were always difficult for me. I would subscribe to blogs in German with good intentions, but then would have to force myself to read even a paragraph a day, as it was so difficult, slow and painful. Right now I am half way through my 12th full length novel in German, all of which I have read only since getting my glasses. Even still, every. single. friggin’. time. that I pick up the book, I still feel like it will be next to impossible. 20 Minutes later I’m five pages in and only then realize that I can do it. When will I learn? How long will it take for this to become my new normal? Nevertheless, in many ways this is my new normal. As I reread that first post, I realized that many of the “tricks” I used, to drive and read and dial numbers on a phone etc., I don’t do anymore. I didn’t even think about losing these behaviors; they simply went away on their own as I no longer needed them. Yet some things are so ingrained in me, like the love of reading but difficult associations with it, that I expect it will take a while for those associations to fade away. I still find myself drawn to podcasts over magazines or newspapers, as I can listen instead of reading the text. I still avoid going into stores because I hate the fluorescent lights, though they do not bother me nearly as much as they used to. And I still leave the drapes drawn in my room most days out of habit, though I did take down the blackout curtains and will sometimes remember to open the drapes and enjoy the light. Enjoying the light is new to me. I don’t mean man-made light, which is proof that the Devil exists, but natural light. Warm, beautiful and comforting. This is just one part of my new world. I forget too, that I am wearing tinted glasses. When I meet someone new, it does not even occur to me that they cannot see my eyes, or that that lack might be discomforting for someone else. I forget to take them off for pictures, and end up looking like a bug-eyed alien, IMHBO (in my highly biased opinion). Because I am not seeing the blue tint, I completely forget that it is there and that other people can see it, until the rare occasion when someone mentions the glasses, at which point I do a double take and remember that I probably look a bit weird. Maybe that is my general dislike of photos of myself that is speaking, or maybe it is because my glasses are so dark blue, or maybe (probably) it is because they are covering up what I consider my best feature, my eyes, but for whatever reason, I think they look weird. Nevertheless, that is not in the least about to stop me from ever wearing them, ever, you have my word on that, pinky swear, cross my heart and hope to die. They make such a huge difference in my life, that I can’t even imagine ever letting them go, not if you gave me a million bucks. At least they didn’t cost a million bucks. The exam and tinting cost about $500, but since it had been many years since I got my prescription checked, I redid that and got new glasses as well, which added another $350 (no insurance). I paid for about half of it myself, and the very generous support of my mom and an aunt and a couple of wonderful friends who helped me, took care of the rest. If you guys are reading this, THANK YOU, THANK YOU, THANK YOU. This blog post cannot adequately describe the difference you made in my life. I love you and appreciate your wonderful help and my wonderful glasses. What do I love about my new glasses? Let me count the ways. I love waking up without a headache, going to bed without a headache, and having no headache the whole day in between. I was in a store the other day and a fluorescent light was flickering badly, and I noticed it but it didn’t bring the expected stabbing pain. I love that florescent lights don’t bother me nearly as much or as quickly anymore. There is an app on my phone called EyeQ, based on a popular speed reading program that I tried, without success, many years ago. The game is supposed to train the eye to respond to letters and other new stimuli quickly. My best score before I got the glasses was 670. I love that in the very first round I tried, soon after I got my glasses, I scored 42,950. This summer I pulled my old violin out of storage, and tried to play. I was pleasantly surprised that the pieces I memorized so long ago are still stored somewhere in my memory. The amazing part though, was that when I looked at the music, I could pick out the notes and they stayed in place on the lines and the lines on the page. I don’t have the time or motivation to take up the violin again at this point, but I love knowing that I could, and that I could actually learn to read music. I love that I can throw and catch accurately for the first time in my life. In my classroom we play a game in which I throw a small stuffed animal to students, and they throw it back to me. I can actually aim accurately and get the parrot to the student, and catch it (instead of flinch or cower) when they throw it back. I love the feeling of security when I am driving at night and the lights coming at me are in a specific spot, and not hazes of diffused light somewhere over there. I love reading in bed at night and not conking out after half a page. I love being able to work on the computer for longer periods and not feeling fidgety and distractible because I can’t stand staring at the screen. I love that, now that I have been wearing and reading with the glasses for about a year and a half, when I take them off and read, the distortions I used to see are somewhat less prominent. Oh, they are still there, please don’t misunderstand and think this is some sort of a cure-all for the miss-wiring in my brain. However, I can see the very first signs that perhaps it is beginning to rewire my brain. Maybe in many years it will help to the point that I could lighten the shade a bit. I have hope now for my future, for a future free from pain and frustration and poor excuses for poor performance. I’m not one to struggle with low self-worth or confidence issues for the most part, but watching everyone around me easily perform what seemed like simple tasks, and not being able to do them myself, always left a nagging question about my own intelligence and capability, that I was usually intelligent and capable enough to hide effectively. Now I know why I couldn’t do those very simple things, and it has nothing whatsoever to do with intelligence or capability. My brain just processes certain signals a little differently than most, and now I can compensate. 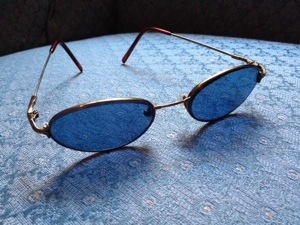 The Irlen tinted lenses are not a cure, but they do effectively control the symptoms so that I can live and work and learn normally. P.S. It turns out that my hearing had the same problem going on, so that I could not always hear well, either. I got that fixed, too, through something called Audio Integration Training. I’ll write more on this process in another post, sometime. Heather, I am SO glad that the glasses have worked so well for you. Many years ago,as a classroom teacher, I worked with students who were dramatically helped by the addition of colored overlays to their books, but it was such a new idea that we got a lot of pushback from parents and the practice was discontinued. It’s good to see that attitudes and technology had advanced so appreciably. Congratulations!! Heather, I am so very glad that the glasses have helped. I have been following your journey and hoping that they would. I have prayed for you as well. Thank you for the very informative posts detailing your issues and how things are going. 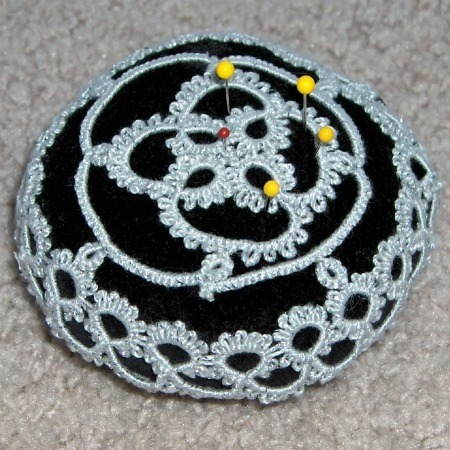 I have pointed tatting students at your tutorials and thank you for those. 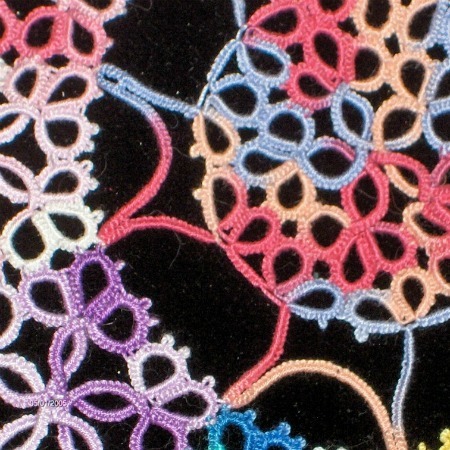 It will be wonderful if you are able to do more tatting and more tatting lessons. 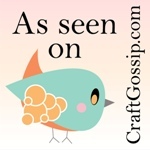 This is amazing I haven’t followed your site closely but I learned to tat from your tutorial. This condition is something I have never heard of before. I am so glad that you have found some relief. Continue on in your recovery!!! Even if no one else notices, you know how much change is happening. Love your lessons. My son was diagnosed last year with Irlen and has used an overlay at school. We just had more done and his tinted glasses are on order! He is so excited to get his ‘super reading glasses’ in the mail in a couple of weeks. I think we have finally figured out what what holding him back! We can’t wait to see his reading take off! I am still surprize by the lase of awareness of irlen syndrome . so The last few week . I have created a bracelet and card and leaflet and poser about Irlen syndrome . I have had a great comment about them. I am so glad that your glasses have changed your world. I agree and understand your feelings regarding others reactions to your glasses. People think that my glasses are so cool but don’t understand the impact they have made. My world have changed so much yet I feel once again that I am invisible. There is nothing wrong with wanting acknowledgment. Enjoyed your post! 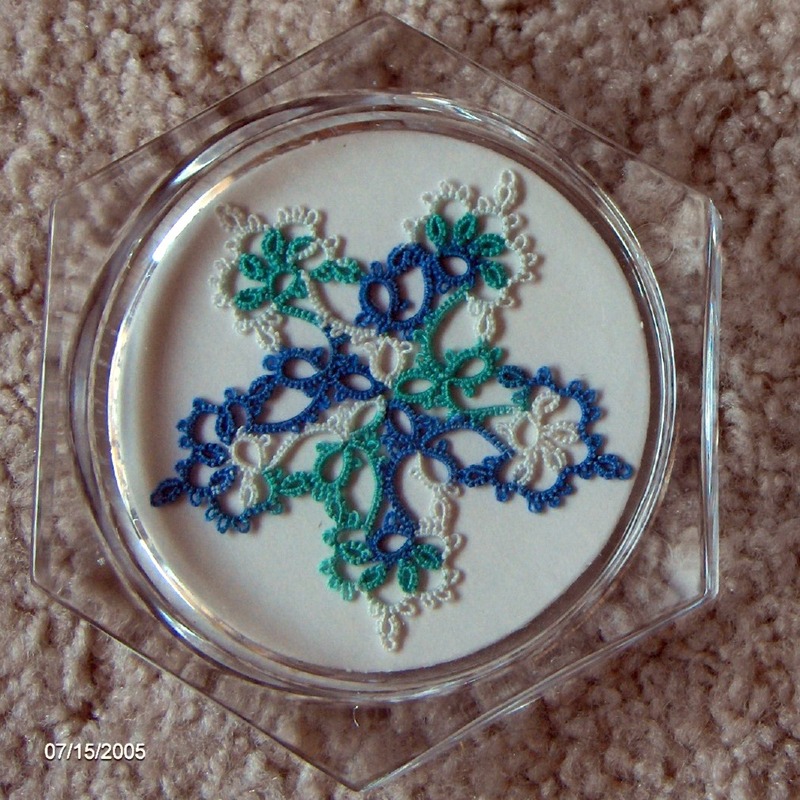 I’m just getting back into tatting and I came back here because I first learned from you. I just finished reading all your posts about this and I am so happy for you!!!! I have found some great face book group which are great in support me and I hopefully get funding soon so I can have my irlen lenses it going to been great . I just now found your update post. I am thrilled that your lenses have given you relief from your many symptoms. From the picture you have posted, it appears that my lenses will be a couple shades darker than yours and simply cannot wait to get them! Right now, I am sitting in the dark with my computer brightness set very low with the blue transparencies taped to the screen. The ‘static’ cling does not work on my Mac – apparently it is autistic too (lol). Anyway, I wanted to thank you again for posting such a detailed account of your story. I found it very helpful and because you have written this independently from their site (i.e. this is not a kind of commercial or paid ‘testimonial’) and you are not selling anything, it gives a lot of credibility to what you have to say. My own experience during the testing was incredible and having read your first entry before the test, it helped me to relax more and put aside some of the ‘fears’ I had after reading some of the controversial information wikipedia included in the information about IRLEN and SSS. After I get my glasses, I will stop in and leave an update here so that others who may be reading might benefit from my own experience as well. I almost forgot! I wanted to ask you if after a while your brain adjusted so that you see color “correctly” after a while. I actually know a little bit about how we “see” color because of my experience in photography. Essentially our brain has an “auto” white balance which is why a lot of times what we “see” is quite different than what the camera does – resulting in pictures that are really off in color. My question is, after wearing your blue lenses for a while, did your brain start adjusting so that you see white as white instead of blue tinted white because of the lens color? If so, about how long did it take before you noticed the change? The Dr. I saw told me that my brain would adjust, but it did not occur to me to ask her exactly what she meant by this. When I was tested for my glasses color, they had me look at bright colored paintings and take the colors away and put them back and make sure that the color of the paintings did not change. It might be different because your glasses are even darker than mine, but I’ve never had a problem with colors looking different. Or if I have and my brain adjusted, I just haven’t paid attention. Sorry I can’t be more helpful with this one. Interesting. We did not have any conversation or testing for my color perception. I hope we got it right. Ugh! I remember that the difference in my reading was extraordinary. The room with the dark lenses was dim, but I did not to a conscious mental check on color. I know outside, the colors with the grey lenses were more vivid and details were sharper without my eyes hurting. I only remember the color and sharpness because I was looking at a flowerbed across the street and was commenting on how beautiful the colors appeared after filtering out the wavelengths that were bothering my eyes. I likened it to using various filters on my camera lens. I told the Dr. that it appeared as though the IRLEN lenses worked the same way. I came across this blog when i searched against my symptoms. I am getting myself tested soon for the lenses. As of now overlays are helping me but i have issues with sensitivity, depth perception and patterns. Its very hard and tough to explain how your life will be affected when you are living with it. I am 37 and never had issues with this in my early life. Maybe it was there but my brain was compensating it and finally gave up after so many years of stress. Maybe now i will get an answer for my question i always had ” I know i am intelligent but never had capability to comprehend it” Last 2+ years of stress had made me think on why i am not normal like others and with no answers. I am just waiting to get myself tested and hoping to get some relief from all these mess. Will keep posted on how it goes. Hi Heather–Several years ago I learned about Irlen Syndrome, found out I needed the lenses, got them, and then became trained to be a screener as I am an educational therapist. I read your account, and was so thrilled with how much the lenses have changed your life. I then read your part 2 and saw your ending about Auditory Integration Training. I immediately looked that up and have now been trained in Berard AIT. I have done this therapy twice and have done it with many clients now. I cannot thank you enough for sharing your story here. Obviously you have helped a lot of people. Would you please tell about your experience with Berard AIT and how it has affected you, gains you have made? Because of you, I am able to help many people!